5TH BLOG ANNIVERSARY GIVEAWAY WINNERS! I was grateful to celebrate the fifth year of my blog with all of you especially to those who have been with me since I started in 2012. Thank you for the 1k plus follow on my Facebook account and to those who joined my social media contests! I read all of your entries but I can only choose five winners who followed the mechanics and amused me with their brilliant and entertaining answers. The giveaway had been successful especially on my Facebook account so as a way of thanking everyone, I decided to pick another winner who sent entries to all of my social media accounts. Please send me an email at perksbewithyou@yahoo.com until February 5, 2018. 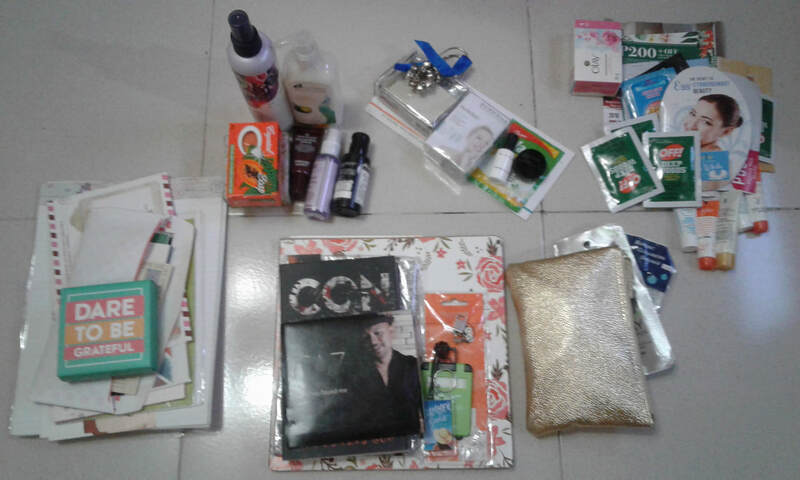 I will be meeting and sending all the prizes until the end of February so kindly wait for it. Again, thank you so much to all who joined and participated in my blog anniversary giveaway! Watch out on March or April for my next contest. When 2017 was about to end, I already promised myself that I will continue having journal/planner for 2018. This year, I will be using not only one but FOUR PLANNERS! Let me introduce you to my task organizers that hopefully will help me to achieve a better and awesome year! I received this as a Christmas gift from a friend. I find this cute notebook perfect for me because I love to travel and discover new places.It has three other kinds of a journal-like Gastadora (someone who spends too much), Nagpipigil (someone who is controlling herself to spend her money) and Yayaman (someone who wishes to be rich). It has lined pages inside and it doesn’t have dates so I can write anytime. I can’t wait to use it soon! When I saw this in a Christian Living store, I wanted to buy it. Unfortunately, during that time, I didn’t have enough budgets. Good thing when I came back, there were two copies left. I instantly purchased the organizers for me and my sister. Inside are envelope pages where the front part there is written: Category, Budget, Date, Description and Amount. At the back page, you can insert paper money for a keepsake. It also has bible verses that make you reflect while writing your expenses. This organizer reminds me of what I bought and used from my salary and it helps me to minimize unnecessary purchases. I won this unique journal from a blogger and though, I am not a freelancer, I’m currently using this for my blog posts and ARC requests. I surprisingly like every bit of this self-help book from Chapter pages, Monthly Run-Through and Sum-Up sections, Project and Budget Tracker, Notes, Doodles and Nuggets, useful tips and even the badass illustration! I’m glad that I owned this wonderful and cool planner! Last October, I attended the Belle De Jour’s Launch Weekend where I bought my 2018 planner. I chose the Focus Planner as my main planner for this year because I seriously want to be serious about managing my life, organizing my schedules and a handy journal where I can bring anywhere. The simplicity of the Focus 2018 planner design captivated me. What‘s inside is definitely fit for me like the pages of My Vision, What I Learned This Year, Weekly lay-out and calendar, Monthly Check-up and Notes. I honestly, write every day from small details to the most memorable things! This is new to me and sometimes I even surprise myself. I hope that I can maintain this habit until the end of the year. Let’s wait and see! How about you? Are you a planner type of person as well? What is/are the planner/s that is you using for 2018? Last month, I was very busy but at the same time, I was grateful for all the experiences and events that I was able to attend to. It’s been awhile since I attended a book signing and I believe Jennifer E. Smith and Jasmine Warga’s book signing was the only International BS event that I went this year. The venue of the said event was at SM Aura Samsung Hall. It was a bigger place compared to the first BS of Jennifer E. Smith last 2014. It was my second time to meet and greet Jennifer E. Smith but I was still thrilled. I was grateful that I was early and part of the first 100 fans to the line-up. It was indeed a memorable book signing event because of three reasons: 1. I was able to meet the adorable and geeky Jasmine Warga and when she held my first self-published book (I was screaming inside!) 2. Hugging Jennifer E. Smith when she talked about rejection, I was truly touched. 3. I got new ARCs from National Bookstore because I won via their twitter contest! Here are some interesting facts that the two best-selling authors shared when they were being interviewed. *They went to Jollibee prior the book signing! -She can’t believe that she can see her books on the shelf. -She is an accidental YA writer and she said that her characters chose the story. -She was inspired by contemporary romance writers. -My Heart and Other Black Holes is in talks to be a movie under Paramount Pictures. OMG! -The book My Heart and Other Black Holes was about what it means to live and die. She wrote it when she loses two persons who are near to her. -After finishing a novel, she loves to play with her kids. -She might be an astronaut or ballerina if she didn’t end up in writing. -When she finished a book, she let it go. -Her latest book, Windfall was very challenging to write because of deeper characters. She considers Statistical Probability of You and Me as the one that changes her life and a gift. -If she will win a lottery, she will get a first class plane ticket and travel more. I like that! The end of November was truly a surprise for me. I attended two wonderful and exciting shows; the first one was the Snow Maiden: A Russian Love Story last November 24 at SM North Edsa Skydome. It was my first time to watch an acrobatic show where I was only a few steps away from the performers. Though most of the acrobats were talented Filipinos, it was amazing to see Russian couples on the stage. I was a bit scared of the last performance where a man and a woman were entertaining their audience while on a ring that was attached to the ceiling. It was the perfect way to end the marvelous show! Ended up my year right with an OPM artist’s concert! Get Music NU 107 NuRock Years happened last November 25 at Araneta Coliseum. The show started late but Itchyworms as an opening act was incredible. The band was very energetic and everyone got to their feet with their songs like Beer, Penge Naman Ako N’yan and Gusto Ko Lamang sa Buhay Ko. Barbie Almalbis’ voice and beauty were like an immortal. She still looks young. Her songs like Tabing Ilog, Torpe and my favorite Dahilan took me back when I was in high school and head over heels in love with my crushes. I surely missed Rico Blanco as the lead vocalist of Rivermaya so watching the band with three vocalists was a bit sad for me. Though they tried to pull out the crowd with 214, Hinahanap-Hanap Kita and Elesi, my friend and I couldn’t help but craved for Rico Blanco’s voice. Ebe Dancel was actually the one I was excited to see perform on the stage. It was a perfect timing that I was able to catch the play: Sa Wakas last January and Sugarfree songs were a huge part of the show. It was wonderful to hear Ebe singing Bawat Daan, Burn Out and Wag Ka Nang Umiyak yet, I found him quite bossy with his team during his act that it was a bit frustrating. Everyone was waiting for Ely Buendia who started his performance by twelve midnight. Save the best for last. Ely ended the concert with songs from Eraserheads and Pupils which truly was spectacular. We were pumped out for another adventure for our second day in Taiwan. Our first stop of the day was The High Speed Rail (THSR) station. One of my friends booked from Klook so we can avail the 3-day THSR tourist pass which cost 3,677 php per person. I was very excited to Taiwan’s speed train because we didn’t have like this one in our country! The seats were very clean and eating on the train was allowed! It was almost a two-hour ride and we enjoyed it very much because we were able to take a nap. Tainan is at the Southern part of Taiwan and the picturesque scenery gave us too much of provincial vibes. After the THSR, we rode a bus going to Tainan. It was still raining so we weren’t able to go down to the right stopover. We first went to visit the Anping Tree House. How to get there: After the THSR, we rode a bus going to Tainan. What can you see? If you are into creepy stuff and love horror movies, this is a perfect spot for your creative imagination. It was a former warehouse that was abandoned but it was good that the government decided to open the place as a tourist destination. Because it was just across away from the Tree House, our next destination was the Anping Old Fort (Fort Zeelandia). How to get there: A five minutes walk across the Anping Tree House. What can you see? The whole Tainan! The place was built by Dutch to strengthen their defense. It was awesome to look at the old Tainan through the photos and things that existed during the time that Dutch took over Formosa (present-day Taiwan). I believed the last part of discovering Tainan was the most unforgettable (right friends?) because we did not only explore the beauty and history of Tainan, we met a new and special friend. We decided to avail the English Walking Tour! My friend, Marianne emailed the Tourism Bureau of Tainan City Government and they sent a representative, the very energetic and gleeful Miss Judy Chou who met us. What can you see? When my friends told me that they wanted to have the walking tour, I remembered the walking tour that I had in New Orleans. I conditioned myself that we were going to walk for quite some time but I was not prepared that we would walk continuously from afternoon till evening! Our feet might be sore yet our minds were filled with so much information from the history of Tainan, appreciating Confucius Temple and other notable temples (the structure and symbolism of a temple, the proper way of entering a temple based on your birth ranking and the importance and contribution of Confucius with the people), the magnificent Wu’s Garden, Hayashi Department Store and their cool time elevator (the biggest department store in Tainan), and the majestic National Museum of Taiwan Literature (the very first national museum dedicated to the literary arts lover like me!) Our stomachs were also satisfied because we got to taste delicious delicacies and dishes that only in Tainan. The second day was truly a busy and exhausting for us but we survived! Watch out what was store for us on our third day in Taiwan. Take note: Going to Taiwan is VISA FREE starting this November! Start saving your pocket money! It had been three years since I went out of the country, going to Taiwan was never a plan of mine but I found myself agreeing to the country that I’ve been familiar because of F4 and Meteor Garden. It was April of this year when my high school classmates (Armina and Bharbhy) informed me and Marianne (another classmate) that they booked a plane going to Taiwan. The idea of out of the country had a strong impact on me because I was planning last year to go to another South East Asian country. Of course, Marianne and I said yes! The planning of where we are going, where we are staying and how much are we going to bring was not easy. It took us even the last day before our flight to finalize everything. Marianne and I luckily had the same flight with my other classmates. We arrived at Taiwan around one in the morning, groggy and sleepy. Yet, we were all excited to explore Taiwan! Because the MRT station would open by six in the morning, we decided to ride on a bus going to our Airbnb place. Luckily, there was an Easy Card machine in the airport so we get our Easy Card which we used every time we ride the bus and train, and you can even use it to buy things! Very accessible! It was like our own Beep card but Easy card is more amazing! As we arrived at our Airbnb place, the usual check-in time in any hotel establishments and Airbnb places in Taiwan is three in the afternoon. You can leave your luggage on lockers (you can find it in train stations and airports) but in our case, we left our luggage in the complex building lobby. This was per advice by our Airbnb contact which was convenient for us because we didn’t need to pay for lockers. Our first stop for our first day in Taiwan was Yehliu Geopark. The magnificent rock formation geopark is located at Wanli of New Taipei City. How to get there: We rode an express bus at Keelung station. What can you see? In Yehliu Geopark, you will be amazed to see a rock formation that you cannot even believe that existing and the evolution of the rocks due to marine erosion. I’ve wanted to see the Queen’s Head because it had been an inspiration to me in one of the stories that I had written. It was raining cats and dogs and the weather didn’t stop us to visit the famous Jiufen Old Street. How to get there: We rode a taxi because the driver promised that we would arrive at the place quickly. What can you see? We had our late lunch at one of the food places in the old street. We ordered these meatballs in a soup which tasted good but our favorite was the fried squid! We tried the so-called ‘Red Vinasse Meatballs’ which was a boo for us. Our taste buds didn’t like it. If you want to have an early shopping for souvenirs, Jiufen Old Street will offer you variety of pasalubongs! It was nearly four in the afternoon when we finally set our tired and sore feet at Shifen Waterfall Park. How to get there: The old railway train to Shifen was fantastic! What can you see? We walked for 40 minutes to see the strong current of the waterfall. The hanging bridge was a win for me! Our last but the not the least stop for our first day in Taiwan was the Shifen Lantern. This very popular place where you can see and make your own sky lantern is a must have for your trip. How to get there: If you are coming from Shifen Waterfall, you only need to walk for 15-20 minutes. What can you see? If you want to make a wish and let the heaven grants it. The colors in the lantern that you chose will represent the things that you want to happen. My friends and I chose: pink (love), blue (work) and white (health). Just seeing our sky lantern up in the sky made us all happy and hopeful. That’s it for the first day! I can’t wait to tell you where we went for our second day and what we discovered more about Taiwan. Take note: Going to Taiwan is VISA FREE starting next month! Book your tickets now! After reading Waiting in the Wings, the first novel that I read from Tara Frejas, I couldn't wait for Pio Alvez's happily ever after story. Finally! It's all fun and games until someone catches feelings. If there's something Pio Alvez is good at, it's pretending to be someone he's not. On stage and on-screen, the actor has mastered the art of becoming the characters he plays, and his new role should be no different. After all, how difficult would it be to pretend to be smitten with a beautiful, intelligent go-getter like Audrey Alonzo? Perhaps it's more difficult pretending not to be. Tara Frejas is a cloud-walker who needs caffeine to fuel her travels. When she’s not on work mode, she keeps herself busy by weaving her daydreams into stories. Aside from her obvious love affair with words and persistent muses, Tara is very passionate about being caffeinated, musical theatre, certain genres of music, dancing, dogs, good food, and romancing Norae, her ukelele. She owns a male bunny named Max who sometimes tries to nibble on her writing notes. Fun fact: She's a Piscean. Go figure. Baguio, theater, and production company. These three are close to my heart and seeing this in one book brings happy memories especially I miss acting on the stage. The name of the places from Baguio in the story resembles a lot of familiar landmarks that I can totally relate to! Facing heartbreak and giving love a second chance. There is so much to be cherished with Pio because he is such a sweet and caring guy. Honestly, I'm not a fan of him from Waiting in the Wings but I'm truly grateful that Tara wrote a story about him. He is more than the pretty and popular face on-screen and on-stage. He is one type of guy that you want to be fall in love, over and over again. I have so much respect with Audrey and I must say that I can relate so much on with the pain and disappointment that she has been through. At some point, I can see myself on her. Risking everything from her family to the work she wants for her life to dreams that she set aside, Audrey is such an amazing woman. Pio having his first debut movie and his biggest and most important fan is right beside him, aww! I giggled and cried with this romance novel that is more than it's beautiful and fantastic cover. My heart and soul are both touched by Pio and Audrey! Tara, I want to hug you right now because you wrote a very compelling story from a heartbreak to finding a new love that also incorporates the close family tight of Filipinos. Well done! The ARC is not enough, I need to have my own soft copy of Like Nobody's Watching really soon! For helping spread noise about my latest book, I’m giving away a couple of prizes to both PH and INTL readers! You may join this raffle once a day, so go and do it! A male point of view and a male author caught my interest when I read the summary of Mr. Prescott. I immediately secured my spot to be part of the blog tour and grateful that I was given one. I’m hooked with the simple plot and a few characters. This is a kind of story that you want to read when you have a bad day or you simply having a rest day. No hard twist and no love triangles, just a romantic story that will surely put a smile on your face. The Youngest Mayor meets an Upcoming Doctor. Nathan Prescott visited the USA for the first time. He only had a short time there, a couple of days and they are all planned. Meeting Nicole, who is working in a library, was unexpected. He was only looking for the book The Silver Mountain not a two day romance affair. The setting of how Nathan and Nicole first met is close to my heart that I really like! Where all it started with a little convincing and the biggest proposal a Mayor of London can utter! I read it in one sitting and it only means one thing, I love the story! I was all smiles and couldn’t help but be jealous of Nicole! So lucky to have Nathan! I’m satisfied from the beginning until the end. Great job Carlos Dash! Thank you to Xpresso Book Tours for allowing me to be part of this blog tour! Isang Mensahe kay Perk’s Be With You: GIVEAWAY! Ito ang kauna-unahang artikulo na aking isinulat sa wikang Filipino simula na ako’y mag-blog. Sapagkat ngayon Agosto ay buwan ng Wikang Filipino, nararapat lamang na ikarangal natin ang atin wika.Bilang pagpupugay ko ay isang naiibang giveaway ang aking naisip. Ang mga premyo na iyong makukuha ay gawang Pinoy! Madali pero makabuluhang at nakakatuwang contest ito kaya basahin at intindihan mabuti ang mga nakasulat sa ibaba. 1. Sundan ang social media accounts ni Perks Be With You: Facebook, Twitter at Instagram. 3. Sagutin ang katanungan ito: Anong katangiang Pilipino ang ipinagmamalaki mo? At pagkatapos ay mag-iwan ka ng mensahe kay Perk’s Be With You. Ang pagiging MATULUNGIN ng isang Pilipino ang pinagmamalaki ko. Hi Perk’s Be With You! Maraming salamat sa iyong munting giveaway! Sana ako ang piliin mong manalo dahil nais kong basahin ang mga libro ni Winter Aragon! 4. Maari kang sumali sa anuman sa tatlong social media platforms pero mas malaki ang tsansa mong magwagi kung gagamitin mo ang tatlo (Facebook, Twitter at Instagram) pero dapat ay iba-iba ang iyong sagot. At sa iyong instagram account: Regram/Repost ang post kasama ang iyong sagot. 5. Magkomento sa ibaba ng links na nagpapakita ng iyong pagsali kasama ang pangalan at kung saan ka nakatira. 6. Mamili ako ng TATLONG PINAKAKAIBA, PINAKAMAKAHULUGAN AT PINAKAMADAMDAMIN na mensahe mula sa Facebook, Twitter at Instagram. Aking ipopost sa Facebook account ko ang tatlong napili ko bago ko i-anunsiyo ang nanalo kinabukasan. 7. Maari kong bigyan ng consolation na papremyo ang dalawang hindi papalarin manalo subalit ito laman ay aking gagawin kong karapat-dapat sa kanilang ibigay at mas maraming sasali sa contest na ito. 8. Ang giveaway na ito ay bukas sa mga Pilipino na nakatira sa Pilipinas. Meet-up: Kung ang mananalo ay taga-Metro Manila. Shipment: Kung ang mananalo ay nakatira sa ibang parte ng Pilipinas. 9. Maari kang sumali mula ngayon hanggang Agosto 27, 2017. Ang mananalo ay i-aanunsiyo sa Agosto 28, 2017. 10. Ang premyo sa giveaway na ito ay binigay, nakuha o ibinahagi sa akin. Wala akong sponsors at walang kaugnayan ang Facebook, Twitter at Instagram sa aking contest. Nawa’y ambunan ka ng suwerte! Hey July, Perk’s Recommended Book!!! How is everyone going? It’s been awhile since I have a book recommendation and since this is a come back for me, I decided that I no longer recommend book/s every month, but I will post book/s that you want to check out and add to your to be read list every now and then. I believe this book that I’m going to recommend is perfect for those who is still studying, who wants to go back to school for those who loves library a lot. The first time that I encountered this hard bound book, I had a doubt if I should buy it. First, because it was a teenage book with no love story, I like library stories, but I became disappointed with the last book that I purchased and finally, the price of it was 199 php only. I let it go for a while yet when we met again in a different bookstore; it meant that I was destined to own one copy of it. Kyle Keeley is a big fan of Lemoncello’s games. When he learned that the famous game maker is going to rebuild and designed their town’s newest library, he is determined to be one of the ‘lucky’ guests to enter and see it for the first time. The most challenging part: Getting in is the easiest part, getting out will take a lot of wit and luck. The Essay contest and the ‘Golden’ Pass… Have you read or seen Charlie and the Chocolate Factory? When Kyle won a ticket to enter Mr. Lemoncello’s Library, I remembered when Charlie received one of the chocolate bars with a golden pass. The essay that Kyle submitted was short but the sentiments that he wrote were too real. Mr. Lemoncello and his Awesome Library! Luigi Lemoncello is a smart man who recreates an old library into a fantastic and up to date setting where students and kids at heart would surely read and hold real books. Keycard, Games and the Ultimate Winner! I love how each game was created, the given clues were incredible and how the winners determined in each accomplished task. Each 12 participants are given unique key cards that can be used as their access in every room in the library, but the keycards as had an important purpose of the last challenge. There could only be one winner, which will be famous! Go #TeamKyle! “A library doesn’t need windows. We have books, which are windows into worlds never ever dreamed possible.” – Well said! I agree too! Lodgepole, Loblolly, Rocky Mountain White, Dandy and 16 words from 16 letters in 60 seconds! This book makes miss visiting a library so much like the quietness of the place, the excitement of browsing and looking at the shelves for a particular book and the smell of new books. Escape from Mr. Lemoncello’s Library book take the library into another level, which I hope most of the local and public library should adopt to so that kids, especially Millenials who grow up with gadgets and just one click away to the world wide web will appreciate library and make it closer to their hearts. Last year was my fourth time to visit Baguio. I’ve been there for one day only because I attended an event and unfortunately, because it was a long weekend, my friend and I weren’t able to get an accommodation. This time around when I went to the City of Pines, it was a long weekend again. Somehow it was different because when my siblings and I went to the Northern part of the Philippines, we came all the way from South aka down under. We arrived late at night of June 23rd and we left the house around six in the morning so we could catch up the earliest trip on Victory Bus. Sadly, because it was fully booked, we took the second trip and we waited for two hours to ride the bus. Honestly, I was not thrilled to go to Baguio because I’ve been there for quite some time. However, I still went with my brother and sister and I must say that I was happy that I did. The plan to go to Baguio was not smooth and there were changes along the way until the day of our trip itself. Let me share with you the places that we’ve been and the foods which we discovered that you might want to check out when you and your family also decided to go to Baguio for a long weekend! It is located in a quiet neighborhood at Naval Base, only walking distance from Leonard Wood Bridge. It is not hard to find because it is surrounded with some apartelle and inns that near to it. We initially booked for a room which could accommodate three to six persons, but, sadly the two people who should be with us couldn’t make it. Luckily, they still had a room for two to four people. -Affordability. If you are a first time traveler in Baguio, I suggest this place. For two nights, we only paid for 3,400 php for two bedrooms. -Customer Service. I loved the friendliness and the fast service of their staffs. -Wifi Connection. It was very accessible and quite reliable. -Bed. Both my siblings commented that they were bedbugs. -Comfort room/Bathroom. There were no floor mat and the bathroom curtain was dirty. It was my second time to go to the place and it was epic failed again! We weren’t able to pick any strawberry because it was off season already! Boo! I appreciated art, but I’m not a fan of it. I was still amazed on how talented and creative Filipino artists! The artist’s imagination and the messages that every painting and artworks convey is fascinating! Check out my favorites among the photos posted above. This nature-themed food place had been one of my sister’s bucket lists in Baguio. It is located inside the famous Camp John Hay. -Popularity. Your interest will be piqued why they are one of the recommended must try in Baguio. -Suman sa Lihia. Hands down with their delicious ‘kakanin’! I was happy that my sister ordered this as her breakfast. I believed Batirol’s Suman was so far the best suman I ever tasted! Good job! -Overprice. It was our first time to have a total bill of whooping 861 php for our breakfast and we were only three who ordered them. -Drinks. My brother was very disappointed with his Baguio Blend and I was not satisfied by their Almond Chocolate. My sister was the happiest with her drink, the Traditional Blend. Underrated ‘lugawan’ that you should not miss to visit when you are in Baguio! The location is perfect for commuters because it is only few meters away from SM Baguio and at the city’s former bus terminal. -Price. If you are on a tight budget, BP’s Goto (50php), Lugaw with Egg (35php) and Arroz Caldo (50php) will surely win your hungry tummy. The serving of each bowl of these Filipino favorites will surprise you! Our total meal with three bottled water is only 189 php! -Service. Customers come and go because of their fast customer service! When you sit down on their stool, their attendant would immediately ask for your order and just a few seconds, the bowl of happiness will be served to you. We were hungry and a bit disappointed because we were not able to accomplish those two itineraries that we had on the list. We were supposed to eat in a known restaurant in a mall, but it was crowded already and we had to wait for an hour just to be seated. My cousin then suggested Sizzling Plate which was across the mall. It was jam packed with people because it was lunchtime, but we were able to find a table for four. The waiter was somehow quite accommodating but he rarely smiled when we ordered our meals. -Side dishes. All of us agreed that thanks to the beans and potatoes, we survived lunch. -Meals. My sister and I ordered Korean Beef Steak which was bland to our taste buds. We had to put condiments like soy sauce, pepper and salt, so we could eat it. My brother on the other hand, didn’t like the Java rice. It was bland to him. -Ambience. My brother kept on complaining that he didn’t like the smoke that stuck inside the restaurant. The first time that we saw the place, we thought that it was a hotel. It was only a walk away from Tulip’s Place. We already decided that we try the restaurant but, our experience on the Session Road made us think twice. However, on our last day in Baguio and we really needed to eat a quick lunch, we chose to dine in the Sizzling Plate at Leonard Wood. -Cucumber Blend and Boneless Chicken Steak. I ordered these two and I fell in love with them, especially the Cucumber Blend, a must try for your first drink! -Interior. I recommend that you visit Sizzling Place at their Leonard Wood branch because of its spacious room and perfect surrounding! I’m grateful for the three days that we stayed in Baguio. Quite short but the memories and the places that we’ve been were truly unforgettable. I hope that I see Baguio again soon!